Meet our Senturus instructors. Learn a little about them and where they’ve been in business analytics. Every member of our team is a senior, bona-fide expert with at least 10 years of experience in the field. Albert founded and runs Senturus training practice. He brings a genuine enthusiasm for information systems integration and training to his work that is reflected in his career. He graduated from the University of Michigan Business School in 1997 with a Bachelor’s of Business Administration (BBA) with a concentration in Marketing and Information Management Systems. He then went on to serve in roles including business systems analyst, technical sales executive, and certified technical trainer. 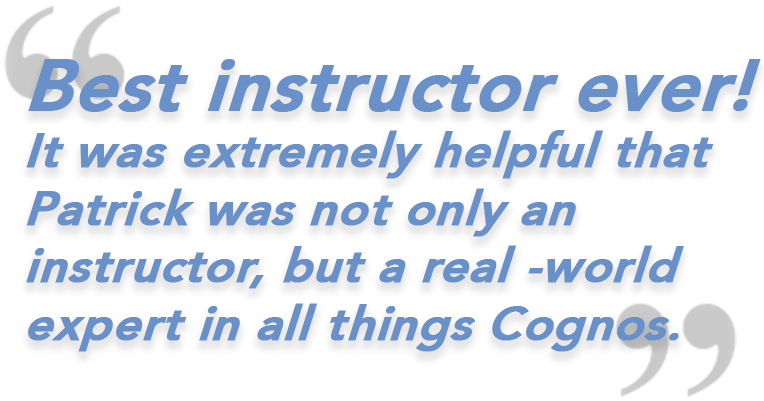 Albert worked at Cognos as a Senior Education Specialist, earning a lifetime designation as a CompTIA Certified Technical Trainer (CTT+), as well as certifications on the entire Cognos Business Intelligence portfolio. Albert’s true passion is in designing and delivering the best learning solutions in the business. He joined Senturus in 2005 as a senior consultant and solutions architect and went on to found Senturus Learning Solutions. Albert has overseen the evolution and growth of the practice from a few Cognos authoring courses to dozens of courses covering the breadth of Cognos Analytics and Tableau. Guided by his exacting standards, Senturus has become recognized for the high caliber of its instruction, offering a rich set of formal classroom training and flexible learning solutions. He is proud of the talented staff of instructors who make up the Senturus training team. Albert’s other passions include raising two beautiful children, backpacking, skiing, cycling, cooking, swimming and live music! Albert lives in Southern California with his wife and two children. September is a Bay Area native with over 20 years of experience in business intelligence and data analytics. Determined to learn everything about everything, she studied everything from chemical engineering to linguistics. She graduated from the University of California, Davis with a BA in English/Sociology and served as a technical writer until quickly realizing that while she was a natural at writing volumes of technical documents, she was born for technical problem solving. She went on to serve as a lead Business Systems Analyst, HRIS Analyst, Procurement Analyst and Financial Systems Analyst before taking on the role of Senior BI Consultant with Senturus 13 years ago. September has over 15 years of expert level experience with the Cognos suite, and extensive experience with Tableau, Business Objects, Crystal and PeopleSoft. She has helped 50+ public and private sector clients with large scale business intelligence implementations including dashboard design, interactive performance metrics development and data modeling. She designs business intelligence course curriculum, delivers 20+ advanced BI reporting courses, develops BI best practice webinars and provides mentoring services for other BI professionals. September’s other passions include spending time with family, cooking, dance, spoken word and kickboxing. Patrick has 20 years of experience in data science, business intelligence and data analytics. He is a Tableau Certified Associate and a Cognos expert whose product experience goes back to version 6. He is also versed in Actuate, Hyperion and Business Objects. His certifications include multiple programming languages, including Java and C++, and database certification (MS SQL). In his early years in BI, Patrick served as Senior Director of Engineering at Instill where he was instrumental in the development of the first wide-spread data analytics use in the foodservice industry. Patrick’s work helped improve foodservice functionality for clients including Applebee’s, Yum Foods and Subway. Patrick also served as Senior Director of Business Intelligence at the consumer division of Experian where he managed the team that brought insight to all groups including retention, sales, finance and IT. Patrick has been with Senturus for over 10 years. During that time he has helped transform analytics for many clients across multiple verticals including healthcare, retail consumer sales, global finance, mortgage and industrial machinery. As a Senturus instructor, he brings both practical hands-on experience as well as over 20 years of classroom experience. Marshall originally hails from the North Atlantic tropical island of Newfoundland and Labrador. After receiving a BA in Political Science/Sociology from Memorial University, a Masters in IT Education from Dalhousie University and a mountain of debt from various financial institutions, he decided to try his luck south of the border. Armed with a five-year “get-out-of-debt” plan and a Canadian exchange rate of 68 cents USD, Marshall started the new millennium two blocks from the White House teaching Windows NT, Microsoft FrontPage and Visual Basic for a local branch of the American InterContinental University. A few years later the West Coast called and he ended up working for the Information Technology Institute in Seattle. It was here that he was introduced to guy named Kimball and something clicked into place. Suddenly, IT wasn't just a set of protocols and cryptic syntax. It was dimensional and measured, and it has led to a wonderful career creating stars, snowflakes and cubes for companies like Cognos, Merador, Labor Ready, Costco, Boeing. Marshall joined Senturus with over 18 years of IT experience, 16 of which have been focused around business intelligence. He is thrilled to be part of the team of instructor consultants where he can put to full advantage his mentoring and training skills. Although 18 years into that original five-year plan, Marshall has settled nicely in the Puget Sound area with his family. These days most of his time is spent shuttling around his three little Cognos geeks in training. Any spare time is spent either bruising his knuckles on a 76 Dodge Power Wagon or renovating a 1922 Craftsman. We are getting more out of this than the IBM 4-day training.